« Susan’s First-Ever Bike To Work Day! Given its strong heartbeat but unwillingness or perhaps inability to move, I figured it was a hopefully uninjured just-fledged chick and brought it out to the backyard where I heard and saw several other hummingbirds, none of whom displayed any maternal interest… leaving me realizing it would be next to impossible to find the nest and thus facing the daunting task of caring for it or more likely get it to someone such as great folks at Animal Advocates, who are far better equipped and informed. 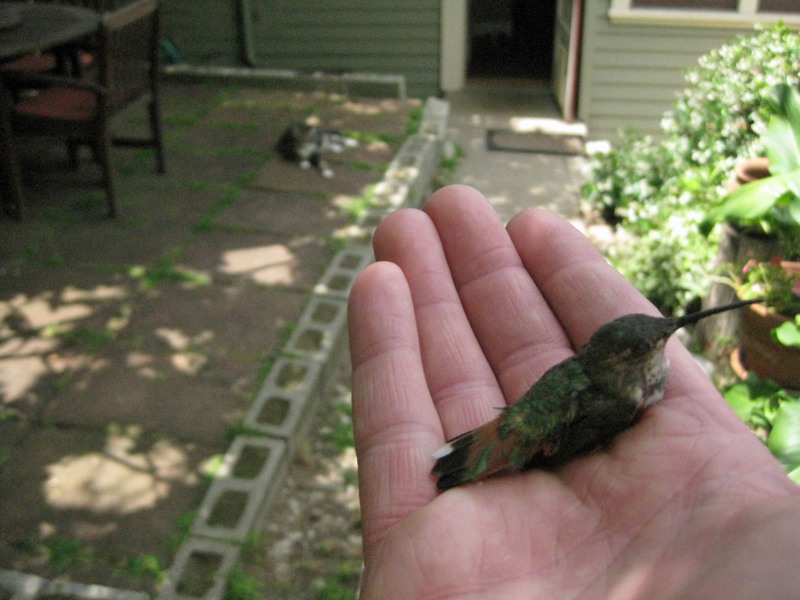 But shortly after the above photo was snapped, as the bird naps in my hand while its abductor lounges triumphantly in the background on the patio, the little bird suddenly solved the entire dilemma by perking up out of nowhere and flying strongly off and out of sight. Yay! This entry was posted on Monday, May 23rd, 2011 at 1:37 pm and is filed under adventure, animals. You can follow any responses to this entry through the RSS 2.0 feed. Both comments and pings are currently closed.